← Stainless Steel products – European Quality vs. cheap Far East imports. ﻿﻿ Catering Equipment Ltd, the company behind clickonstore.net, was formed 15 years ago in Central Birmingham. The prime purpose of the business is importing finest quality Italian catering equipment and distributing throughout the UK on a next day basis. 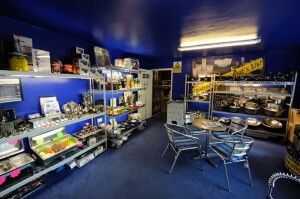 Today, Catering Equipment Ltd holds over 72,000 items in stock in their Kings Road, Tyseley warehouse. The warehouse is located in the Speedwell Trading Estate which has access from Kings Road. There is a smart display area at the front of the warehouse, where customers who prefer to shop and collect their goods can come and view our products as well as enjoy a cup of tea or coffee with our compliments. There is free, secure parking right outside the warehouse. We aim to not only offer value for money on quality catering components, but also an enjoyable experience when dealing with us. Why not take a look at our website www.clickonstore.net and see what a great range of products we have available. This entry was posted in News and tagged birmingham, catering equipment limited, showroom, tyseley, warehouse. Bookmark the permalink.